VIPAccessEXCLUSIVE: Bryce Gheisar Interview With Alexisjoyvipaccess At The John Kerwin Kids’ Show! It’s time to get in on some pranks, and we know just the right guy to help – none other than the incredible Bryce Gheisar! Disney X D’s magnificent show, Walk The Prank is truly one of our favorite shows out. The unique and fun-filled show is unlike anything we have seen on the network thus far as it combines both scripted comedy and real-life pranks. In the show, a group of pranksters set out and play some of the most hilarious and shocking pranks to capture real responses from people who never would have guessed or imagined that they would be the next target for a prank. Needless to say, Walk The Prank has us laughing from start to finish and we definitely have the amazing cast to thank for that. Starring in the show as Herman is the brilliant and fantastic actor, Bryce Gheisar. There are so many things that we can say about the outstanding Bryce Gheisar and how he blows us all away with his extraordinary talent and excellent charisma both on and off-screen. In addition to bringing some extra excitement on Walk The Prank, Bryce Gheisar has also made his way on over to the big screen in several projects including A Dog’s Purpose and in the highly anticipated movie, Wonder, which also stars Julia Roberts and Jacob Tremblay, which is set to release in theaters in November. Bryce Gheisar has one of the most captivating and exuberant personalities. He is someone who fills up the room with his positive vibes, his bubbly and outgoing personality, and his terrific charm. At such a young age, Bryce Gheisar has already accomplished so much and he shows such professionalism in everything that he does. From working on set of a hit show or renowned movie, to making appearances on talk shows, as well as walking the red carpet, Bryce Gheisar does it all so effortlessly with such a natural and genuine gift for being a marvelous star in the entertainment world. There are some people destined for success and Bryce Gheisar is truly one of them! I, Alexisjoyvipaccess had a great time covering the John Kerwin Kids’ Show and had a wonderful time interviewing the phenomenal Bryce Gheisar at the show. 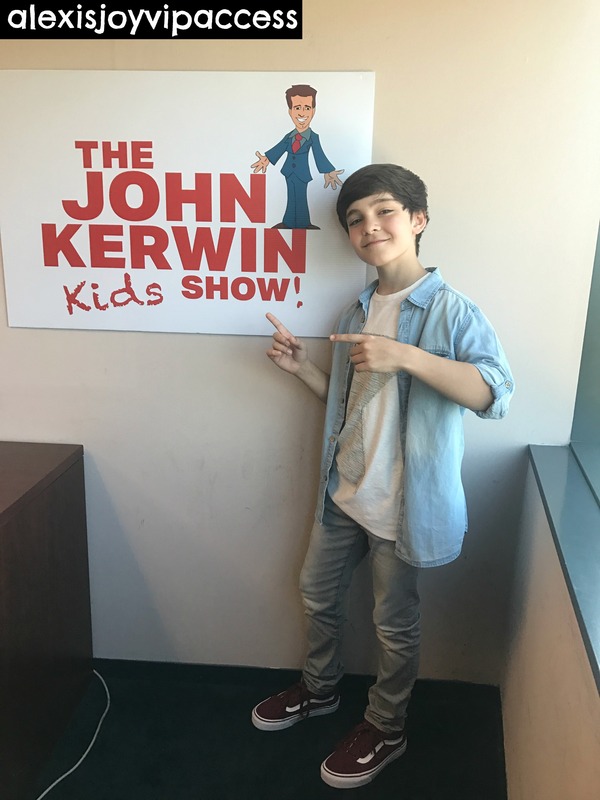 Bryce Gheisar dished exclusively to Alexisjoyvipaccess about what it was like for him to appear on the John Kerwin Kids’ Show, what his favorite episode is from Walk The Prank, who is the biggest prankster on set, and so much more only in our VIPAccessEXCLUSIVE interview. Bryce Gheisar even took on a fun speed round and revealed something that fans may not know about him, what his favorite emoji is and more – hear what he had to say in our VIPAccessEXCLUSIVE interview below. Thanks for the awesome interview, Bryce! Check out my VIPAccessEXCLUSIVE interview with the exceptional Bryce Gheisar at the John Kerwin Kids’ Show below! Previous VIPAccessEXCLUSIVE: Nathan Arenas Interview With Alexisjoyvipaccess At The John Kerwin Kids’ Show! Next VIPAccessEXCLUSIVE: Fuller House’s Michael Campion Interview With Alexisjoyvipaccess At The John Kerwin Kids’ Show!